SSRN recently released our Purchase Bound Hard Copy Service. Authors and readers can now order printed copies of select papers in the SSRN eLibrary, which provides another format for users to access research papers. The Free One-Click Download option is not affected by this new service. For $9.99 plus shipping, the reader will receive a black and white printed and "perfect bound" copy of the PDF document with a glossy color cover. 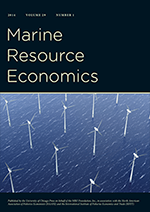 The cover includes the title of the paper, and the authors with their affiliations. A sample cover and additional details about the Purchase Bound Hard Copy service, including details on which papers are eligible, are available on our FAQ. We invite you to try this new service and share your experience with us. In the old days, working papers were printed out and bound by departments who wished to distribute them in a more formal way. These days you print the PDF, read the paper and then recycle it. Why would anyone want to pay $10+ for fancy binding? Unless you wanted to show your mom your excellent paper (and, yes, I'm looking at you Tim). There was a hearing yesterday at the House of Representatives, Natural Resources Committee, Subcommittee on Fisheries, Wildlife, Oceans and Insular Affairs: "NOAA's Fishery Science: Is the Lack of Basic Science Costing Jobs?" I've sat through a number of long SSC meetings (here is a link to the last agenda) where fishery biologists have wrestled with this lack of data. It has been a real slog. Unrestricted Trading: Letting utilities comply with a standard by submitting credits that could be bought and sold independent of the electricity generation with which they were associated—rather than requiring that each utility get a certain percentage of its electricity directly from renewable or other clean sources—would help overcome various regional limitations and thereby lower utilities’ compliance costs. Expanded Compliance Options: If regulators linked the amount of credits that various technologies could receive to their emissions, then letting both existing and new sources of electricity generation earn credits (rather than just sources that started operating after the policy began) could help better align financial incentives with actual emission reductions. Total costs of reducing CO2 emissions could be lowered even further by allowing emission-reducing improvements in energy efficiency to qualify for credits. For example, generators could upgrade their plants in a manner that allowed them to produce the same amount of electricity from less fossil fuel. Even with a wide variety of compliance options, neither an RES nor a CES would be as cost-effective in cutting CO2 emissions as a “cap-and-trade” program, which could provide direct incentives for cutting emissions throughout the whole economy. Gradual and Flexible Timing: Electricity generation typically involves investments in large-scale and long-lasting physical equipment, and U.S. demand for electricity is growing slowly enough that the potential for investment in new generation and distribution capacity is fairly small. Utilities and generators would therefore benefit from provisions that phased in an RES or CES gradually over an extended period. They would also benefit from being allowed to transfer credits between different time periods—by “banking” current excess credits for use in later years or by “borrowing” credits that they expected to earn in the future for use now. It is my impression that proposals for renewable portfolio standards do not include unrestricted trading, expanded compliance options or gradual and flexible timing. I would be happy to be wrong. Renewable electricity standards (RES) would require a certain share of the nation’s electricity generation to come from renewable sources, such as wind or solar power. Clean electricity standards (CES) would require a certain percentage of the nation’s electricity generation to come from renewable sources or nonrenewable sources that reduce or eliminate CO2 emissions, such as nuclear power, coal-fired plants that capture and store CO2 emissions, and possibly natural-gas-fired plants. The going rate here has been about $50 an hour per musician for more than a decade, but when business began to dry up and newer musicians moved in a few years ago, competition became far more intense. Some were willing to drop their price to $30 an hour, and shouting matches over who would get the infrequent jobs would occasionally turn into fistfights. Now, roughly 200 mariachis have joined the United Mariachi Organization of Los Angeles, a group that formed to set a minimum price in the plaza. To join, musicians must pay $10 a month and pledge not to charge less than $50 an hour. In return, they receive a gold-colored picture identification card, which leaders hope customers will recognize as a badge of authenticity. With decreased demand a union wage is sure to create a surplus of labor, especially with some consumers willing to forgo some quality in order to enjoy the lower price. My guess is that the $50 an hour pledge won't last long. In the words of John Lennon, "you may say I'm a dreamer, but I'm not." Rather than subsidizing the production of unhealthful foods, we should turn the tables and tax things like soda, French fries, doughnuts and hyperprocessed snacks. The resulting income should be earmarked for a program that encourages a sound diet for Americans by making healthy food more affordable and widely available. Simply put: taxes would reduce consumption of unhealthful foods and generate billions of dollars annually. That money could be used to subsidize the purchase of staple foods like seasonal greens, vegetables, whole grains, dried legumes and fruit. Putting all of those elements together could create a national program that would make progress on a half-dozen problems at once — disease, budget, health care, environment, food access and more — while paying for itself. The benefits are staggering, and though it would take a level of political will that’s rarely seen, it’s hardly a moonshot. Er, yes it's a great idea, but definitely a moonshot. Have you noticed how any government policy that includes the words "tax increase" is handled these days? Note: Thanks to Dinner for Schmucks for the quotes. “If that means more to you than getting a plan and stabilizing this economy, you’ve really got to wonder why you’re there,” said Alan K. Simpson, a former Senate Republican leader who was a co-chairman of the bipartisan fiscal commission Mr. Obama set up last year. Though anti-populist in the extreme, the bulb ban in fact evinces none of the polished wonkery you’d expect from sophisticated technocrats. For starters, it’s not clear what the point is. Why should the government try to make consumers use less electricity? There’s no foreign policy reason. Electricity comes mostly from coal, natural gas and nuclear plants, all domestic sources. So presumably the reason has something to do with air pollution or carbon-dioxide emissions. Nor does it allow households to make choices about how best to conserve electricity. A well-designed policy would allow different people to make different tradeoffs among different uses to produce the most happiness (“utility” in econ-speak) for a given amount of power. Maybe I want to burn a lot of incandescent bulbs but dry my clothes outdoors and keep the air conditioner off. Maybe I want to read by warm golden light instead of watching a giant plasma TV. What matters, from a public policy perspective, isn’t any given choice but the total amount of electricity I use (which is itself only a proxy for the total emissions caused by generating that electricity). If they’re really interested in environmental quality, policy makers shouldn’t care how households get to that total. They should just raise the price of electricity, through taxes or higher rates, to discourage using it. Instead, the law raises the price of light bulbs, but not the price of using them. In fact, its supporters loudly proclaim that the new bulbs will cost less to use. If true, the savings could encourage people to keep the lights on longer. Why didn't I say that? Maybe this or this. Almost whatever happens this week with Washington’s debt talks, the economy will most likely be worse off. Three of the five scenarios lead to recession and the best case scenario is the least likely. In addition to the failure of the politicians, this situation is a huge failure for the economics profession ... which should be advising that the debt vote be decoupled from everything else. Official oldest daughter of Env-Econ's softball team has qualified for the ASA Northern Nationals in Bowling Green, Kentucky this week. Fifty-Five teams from 11 states. Hopefully their coach (me) can lay off the KY bourbon long enough to keep from embarrassing himself.